We didn’t get all of the action, but Barry Shulman got it all in with K K on a flop of J J 4 against a flush draw from Danny Wong. The turn and river were safe for Shulman in the 10 7 and he doubled up to 75,000. Wong is currently sitting on 14,000. Danny Wong was all in for 14,000 with the A A 7 3 and was up against the Q Q J 10 of his opponent. The board ran out 9 4 2 7 2 and Wong doubled up to 30,000. Michael Mizrachi was all in for 4,100 with the A A 7 2 against the J 9 8 6 of an opponent. The board ran out K 7 6 7 3 and Mizrachi doubled to 9,000. An under-the-gun player bet 1,100. Tony Cousineau raised to 3,900. Mike Matusow called and so did the original bettor. The flop came K 9 4 and action was checked to Cousineau. He bet 2,700. Matusow called and the other opponent potted. Cousineau called all in for his tournament life. Matusow folded. Cousineau tabled the A A 8 6 while his opponent exposed the A J 9 K . Cousineau was behind against the two pair of his opponent. Both the turn and river bricked for Cousineau and he was gone. Steve Sung limped in from early position and the cut off raised to 5,300. Both the small blind and big blind called and the action came back to Sung, who reraised to 23,500. The cutoff thought about it for a few minutes before he decided to fold and the small blind surprised many at the table my nonchalantly throwing in the call. The big blind was tempted, but he too folded. The flop came down A 6 2 and Sung continued with a bet of 18,000. The small blind quickly called and the turn was the 7 . This time, Sung fired in 40,000 and the small blind quickly folded. Sung is now stacked with just over 200,000 in chips. On a flop of 7 6 4 , David Baker put Hasan Habib all in. Habib thought about it for a few minutes before he called, turning over 8 7 for top pair and a gutshot straight draw. “That’s not the hand I wanted to see,” said Baker as he revealed his 6 5 . The turn and river came Q K and Baker’s runner, runner flush sent Habib to the rail. Baker now has 163,000 in chips. 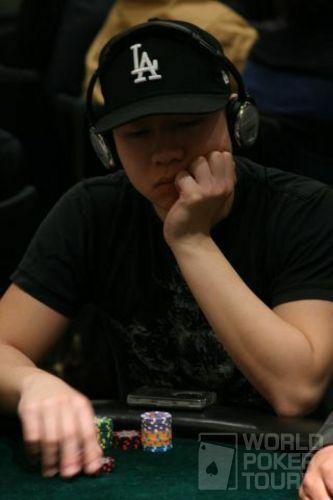 Danny Wong got the rest of his stack in with A-K only to see that he was up against Mark Newhouse and his pocket jacks. The jacks held and Wong was eliminated. Newhouse now has 250,000 in chips. Todd Brunson was short on chips when he decided to make his move. Unfortunately, he ran right into the pocket kings of Daniel Negreanu. The kings held, Brunson busted and Negreanu increased his stack to 355,000. Pat Pezzin was short and moved in for his last 18,500 with Ad 10h. Marco Johnson made the reluctant call with K Q , but it failed to connect with a board of J 6 5 2 9 . Pezzin still has work to do with about 40,000 in chips, but Johnson is still relatively safe with 100,000. As many of you may know, the U.S. Hockey team was facing off against the Canadian Hockey team for the Gold medal in the Winter Olympics. With about 30 seconds left on the clock in the third period, Daniel Negreanu came over to fellow Canadian Pat Pezzin for a bit of a premature celebration. Amazingly, the U.S. team score a goal to tie it up and send it into overtime. The heavy American friendly room exploded into celebration and even Tournament Director Matt Savage got in on the act, needling Negreanu back to his table. Of course, the Canadians were the first to score, thus ending the tournament and causing a much smaller celebration to erupt in the room near Negreanu’s table. Negreanu even went so far as to sing the U.S. national anthem as he basked in victory. As a blogger, I should remain impartial, but I must point out the the Olympic system is flawed since the U.S. already beat Canada and scored more goals than they did in the series. Enjoy your tainted win, Daniel. A player under-the-gun raised to 700 and got four callers, including Matt Hawrilenko from middle position. The flop was K 4 7 and the original raiser bet 1,800 and Hawrilenko called. The turn was the 10 and the river was the 6 . Both players checked the turn and the river and Hawrilenko mucked when he was shown K 9 and is down to 9,100 in chips. With about 17,000 in the pot already, Dennis Phillips was heads-up with his opponent with a board that read A 4 5 10 . 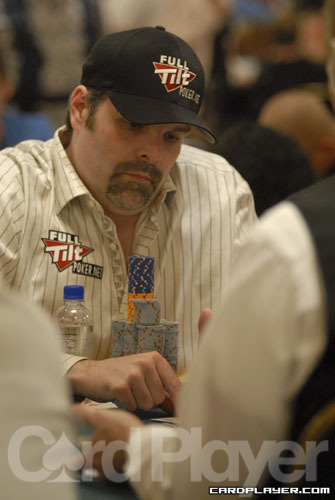 After a flop of K 9 2 , Howard Lederer led out with 2,000 into a pot of 2,500 and his opponent in seat 1 mucked his hand. Lederer was at 23,200 after that hand. Later, Lederer raised to 1,300 from the button and the small blind immediately reraised to 3,500. It was just in time for the ESPN cameras to arrive at Lederer’s table. After a few moments to think, Lederer mucked his hand and he was at 20,000 early in the level. Picking up the action on the river, the board showed J 4 2 10 8 . Darus Suharto of “November Nine” fame and his opponent checked the action and Suharto showed down 6 6 . It was good as his opponent tabled A 6 and Suharto took a pot, moving his stack to 20,000. John Cernuto and Tom McEvoy saw a flop of A Q J . Both players didn’t like the board and checked. The turn was the Q and Cernuto took a stab at the pot, leading out for 1,200. McEvoy stuck around and the players saw the 9 fall on the river. Cernuto checked and McEvoy did the same behind him. McEvoy showed A 6 for two pair and Cernuto mucked. McEvoy was at 17,000 while Cernuto was at 35,000. 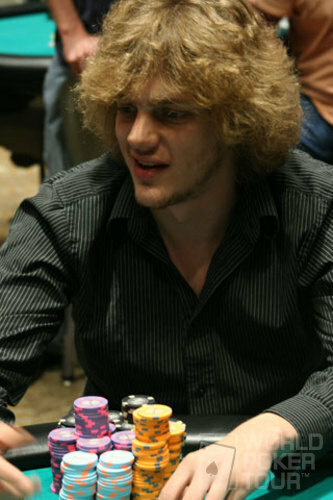 After a flop of K 8 7 , Marcel Luske was first to act and elected to check. His opponent then fired 600 into a 1,500 pot. Luske then pounced, check-raising to 2,000. His opponent glanced at his cards one last time and threw them into the muck. Luske took the pot and was at 42,000. Four players limped for 300 preflop and they all saw a flop of 9 8 2 . 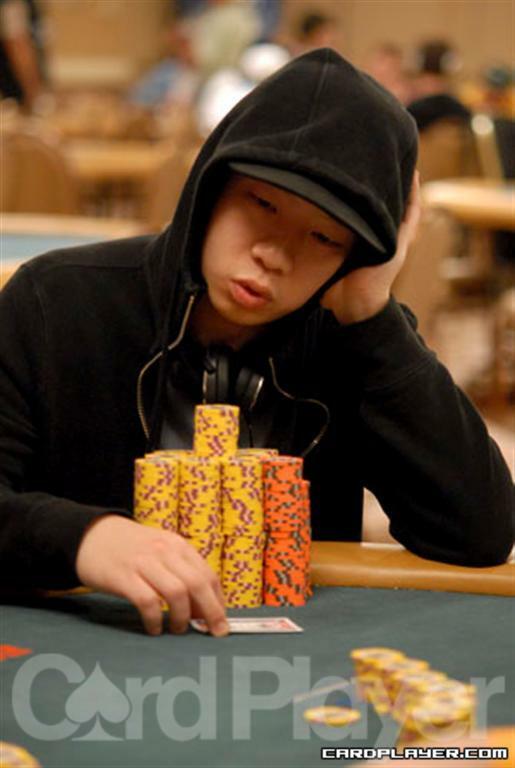 The player in seat 9 fired 500 into the pot and Danny Wong raised to 1,600 from the cutoff. The player under the gun was also in the hand and made the call. Everyone else mucked and the 5 fell on the turn. The under the gun player checked and Wong bet again, this time 3,600. His opponent mucked and Wong took the pot after showing 9 8 . He was at 36,000 after the hand. Gavin Griffin raised to 800 from the hijack position and the small blind made the call. The player in seat 3, who had already limped, made the call as well. The flop then fell 10 8 6 and the action was checked to Griffin. He fired 1,700 into the pot and his opponents quickly mucked their hands. Griffin took the pot and was at 38,000. Picking up the action after the river, the board read K 9 8 7 8 . The action was checked to John Juanda and he bet 3,500. The player in seat 2 mucked his hand and the player in seat 6 was next to act. He reached for his cards to throw them in the muck. “No!” Juanda exclaimed. “1,000,” he said as he took 2,500 away from his original bet. Seat 6 didn’t bite and his hand finally landed in the muck. Juanda scored the pot and was around 50,000. Wong shoved and Lichtenberger called. Wong showed A 10 but was way ahead of Lichtenberger’s slowplayed pocket aces. Blinds: 2,000-4,000 with a 500. 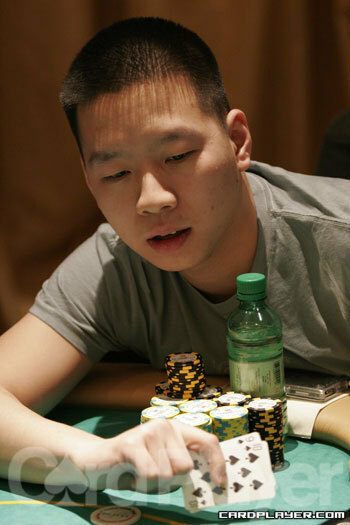 Kenny Tran doubled up to 225,000 after he rivered two pair, jacks and deuces against Dutch Boyd. Boyd put him all in on the river and mucked after seeing his opponent's superior hand, leaving himself with just over 255,000. Danny Wong made his move preflop with A-J but ran into Liv Boeree's A-K. The board gave both players an ace but Boeree's kicker prevailed to send Wong to the rail. Boeree increased her stack to 330,000. Steve Sung's A-Q dominated and eliminated Joe Sebok's A-J to build his stack to 1,165,000. Card Player TV talked to Steve Sung during the last break about being one of the chip leaders. On a board of Q 7 2 6 . with 2,400 in the pot, Paul Smith bet 3,500 and Greg Thompson made the call. The 9 fell on the river and seat 3 bet 3,500. Smith thought for a moment and then mucked his hand. Joe Sebok was short stacked and all in holding A-Q against the pocket sevens of Freddy Bonyadi. 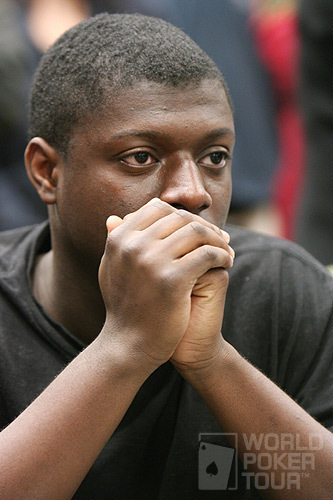 The board offered no help and Sebok was eliminated from the tournament. The betting action is unknown, but James St. Hilaire held a set of nines on a board of 9-8-3-7-K. Wong thought over his option on the river before mucking bottom set of threes, keeping himself alive in the tournament. Erik Seidel got it all in holding kings and feeling comfortable, but his outlook changed when he saw Young Phan's pocket aces. The board helped neither player and Seidel was eliminated from the tournament. Gavin Griffin was all in holding pocket nines and up against his opponent's A 10 . The flop brings three clubs and Griffin is drawing very slim. The turn and river bricked his runner-runner outs and Griffin was eliminated from the tournament. On a flop of K 5 5 Phil Hellmuth checked and David Chiu bet. 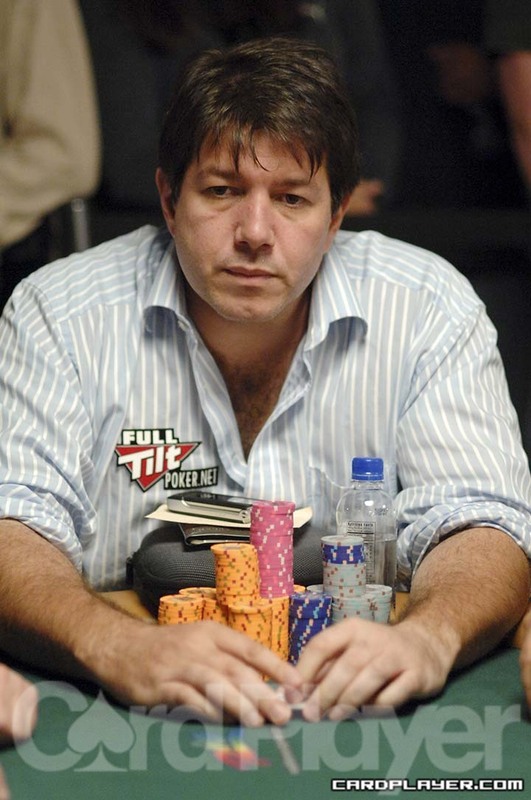 Hellmuth check-raised and Chiu shoved all in. Hellmuth made the all-in call and flipped over K-10. Chiu held A J and the turn and river fell 7 4 . Hellmuth doubled up on the hand to survive. With over 15,000 in the pot and K 3 2 A J on the board, Yevgeniy Timoshenko bet 9,500 from the button and his opponent went into the tank in middle position. 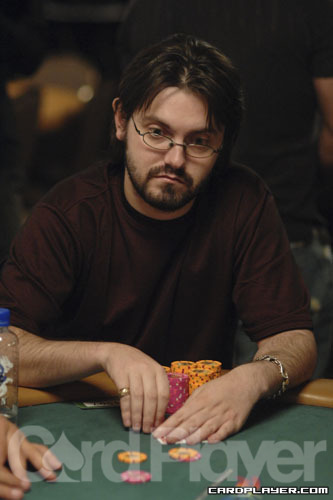 He eventually made the call and Timoshenko flipped over A J to win the pot. On the very next hand, Kenneth Smaron limps and Danny Wong moves all in for 2,000 behind him. Mark Teltscher completes from the small blind and Hafiz Khan knocks the table in the big blind. The three players check down a board of A 5 4 J 3 all the way to the river, where Smaron bets 15,000. Teltscher and Khan muck and Wong asks Smaron if he has pocket deuces. Sure enough, Smaron shows deuces. Wong has to sweat his cards, but can only produce Q 8 to be eliminated in tenth place. Remy Biechel is all in against Danny Wong. Biechel shows 8 8 and is racing against Wong's A K .
The flop comes A K J and Wong takes the lead. The turn is the 7 and Biechel is down to his final two outs. The river is the..... 8 ! Biechel double up to 140,000 and Wong is left with just 3,000 in chips. Danny Wong busted out of the tournament during level 8 when he ran pocket queens into pocket aces. Heads-up, David Benyamine got it all in before the flop with Q J against Marc Klecan's J 5 . All in, Benyamine was in a good position to double up here until the flop came 6 5 5 , giving Klecan trip fives and reducing Benyamine to catching two running queens to win or two running sixes or two running jacks to chop the pot. The turn and river brought the K 7 , sending Benyamine to the rail while Marc Klecan advances to the second Round. On a flop of A 10 8 , Antonio Esfandiari got it all in against two other players. The turn and river brought the 6 and the 3 , both other players checked the side pot down. Esfandiari turned over A 4 for top pair no kicker while one of his opponents showed A 7 for top pair, better kciker. The sevn played and Esfandiari hit the rail early in Level 6. Three-handed, Jeff Shulman was all in before the flop against both Jason Young and Eric Arreca. The flop came 7 6 3 , and both players checked at the side pot. The turn was the J , and once again, both players checked the side pot. The river was the 10 , and Arecca fired a bet at the pot. Young folded and Arecca turned over 7 6 for two pair. Shulman mucked his hand and headed towards the rail while Arreca raked the main pot.. Shulman's elimination leaves Jason Young playing heads-up with the chip lead as he looks to advance to Round 2. 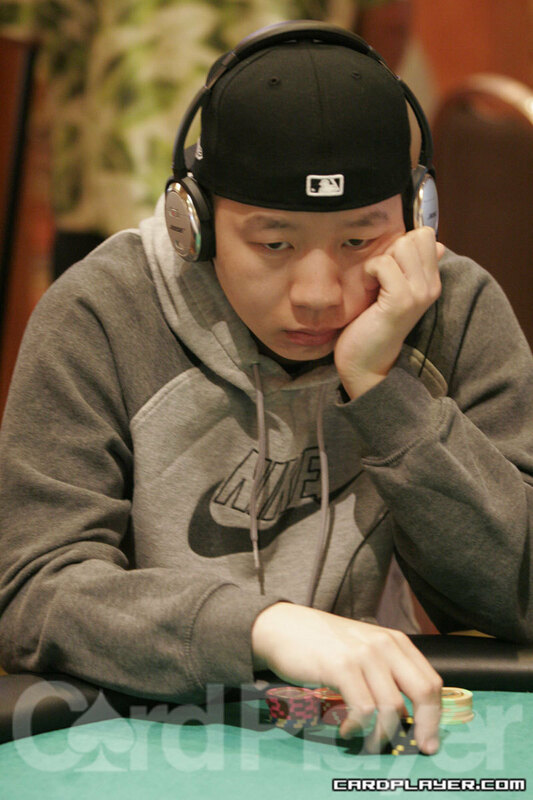 Young won the $1,500 No-Limit Shootout (Event No. 17) earlier this summer. On a flo pot Q J 5 , Tim Finney bet and and Danny Wong made the call. The turn was the 6 and once again, Finney bet at the pot. This time Wong raised, Finney reraised, and Wong three-bet him all in. Finney called for the rest of his chips and Wong turned over Q J for top two pair. The river was the K and Finnry mucked his hand, sending Danny Wong to the second round. Danny Wong bet a flop of A 6 5 and was called by Jean-Robert Bellande. The turn brought another 6. The river was the 6 and Bellande bet out, which was enough to put Wong all in. Wong called, but mucked when he saw Bellande's A 8 for a full house. After three-betting preflop, Jean Robert-Bellande bet every street on a Q 5 4 10 K board and was called down by Joe De Niro. Bellande showed that he had nothing until the river, where he completed a straight with his J 9 . He scooped a large pot that put him around 1,700,000 in chips. De Niro's stack dropped to 650,000. Spencer Lawrence got all of his chips in the middle preflop against Jean-Robert Bellande and showed K 10 . Bellande was the favorite, holding A 9 . The flop came 9 6 3 , giving Bellande a pair. Lawrence still had two overs he could connect with, but the 2 came on the turn and the Q river card eliminated Lawrence in sixth place. Preflopp action was raised until capped by John Kranyak and Joe De Niro. When 9 4 3 fell on the flop Kranyak bet and was called by De Niro. The A came on the turn, inducing action. Betting was capped again, getting Kranyak all in. He had connected with the ace on the turn and showed A J . However, De Niro showed A Q for a pair of aces with a queen kicker. The Q dropped on the river to give De Niro two pair and the juicy pot, sending Kranyak to the rail in seventh place. Andrew Prock got all in preflop and held A Q , a favored hand over Joe De Niro's A J . The flop changed things fast, coming A J 3 to give De Niro two pair - aces and jacks. The K fell on the turn, giving Prock more outs. But the river 8 wasn't one of them and Prock was eliminated in eight place. Michael Kachan put in a raise preflop and was called by Brandon Wong, Danny Wong, Jean-Robert Bellande and Spencer Lawrence. The flop brought A 7 6 and Danny Wong led out. Lawrence got out of the way, and Kachan raised all in. Brandon Wong folded and Bellande put in yet another raise. Danny Wong called, and when the 4 fell on the turn both he and Bellande checked. The Q fell on the river and Wong bet. Bellande folded and Wong showed A K . Kachan couldn't beat Wong's pair of aces and was the first player eliminated from the final table. Players are on a 20 minute break. Matt Graham bet every street on a board of K J 9 8 10 and was called down by Spencer Lawrence. Graham showed he rivered the broadway straight with A Q in his hand and took the pot. 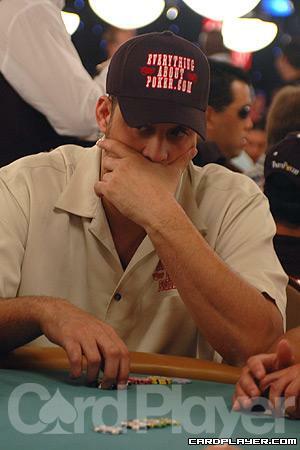 John Kranyak has climbed up the leaderboard by winning several big hands throughout the level. In one big 3-way Kranyak raised after Jean-Robert Bellande bet a flop of K 10 6 and Bellande and Brandon Wong called. Kranyak bet the K turn and was called again by both opponents. The 9 on the river was a scare card and all players checked. Kranyak showed K 7 for trip kings, Bellande mucked and Wong showed A 10 . Kranyak took a big pot and ended the level with around 650,000 in chips. Jean-Robert Bellande has won a handful of early pots early in the final table to take the chip lead. In one pot Bellande bet with the board showing 8 7 2 9 and his opponents mucked. In another hand, Bellande bet and was called by Danny Wong with the board showing 9 6 3 8 7 . Bellande showed Q 10 for the rivered straight to take the pot and jump to around 420,000 in chips. Bellande has also expressed his disappointment in the final table location. He said he thought the final table would be played in the Milwaukee's Best Light final table stadium, but instead it is outside the stadium at a normal table.